I immediately thought they might be Risso’s dolphins as they are the most commonly found species in November. 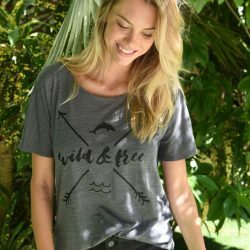 I’ve been to Taiji for four years now, and I’ve seen more than my share of slaughters. While all are horrific, I was most affected by the slaughter of a pilot whale family that I witnessed two years ago. Since then, I’ve hoped and prayed never to see another slaughter of any type again, with the pilot whales continuing to hold a special place in my heart. I think I was in denial that day, that it might be pilot whales. As the drive moved nearer, Vicki and I took enlarged the photos we took, and my worst fears were confirmed: pilot whales had been found. As the pilot whales were netted in the Cove, the familiar spy-hopping began. The family huddled tightly together, exhausted and terrified. I had seen this before, a visual burned forever into my mind. They were attempting to figure out what was happening – why they were trapped in this little area, netted for the very, first time in their lives. The family was huge, consisting of pilot whales of all ages. 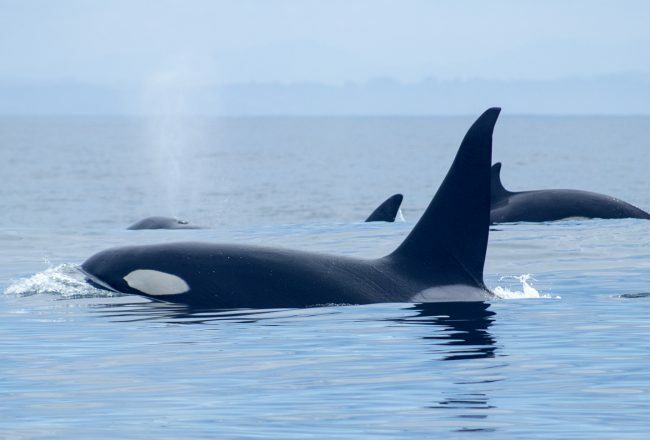 I could see the tiny fins of young juveniles, all the way up to 25 foot long males. There seemed to be many young dolphins in this 60+ member family. I was devastated, as I knew what was in store for them. After the several hours long drive, with all the pilot whales netted securely to prevent escape, the hunters left for the day. The family huddled together at the outer nets. The matriarch could be seen swimming in circles around the young ones, often on her back, gently touching them with her fins. It was heartbreaking. I will never forget their sweet faces bobbing up and down in the water, with a heart-shaped design they carry on their chests. This was the last night they would be together, a night consisting of fear, confusion and no food. Early in the morning, Vicki and I trudged up the dreaded hill which provides a view into the cove. The horror began the moment the hunters arrived. They immediately started to herd the family towards the kill area, hidden from view by a series of tarps. It was a fierce struggle, given there were so many pilot whales, and a large group managed to break free, swimming to the outer cove. The rest of the pod were pushed into shallow water. It was during this traumatic and graphic struggle for life that the dolphins’ devotion to one another became crystal clear. A large pilot whale had become trapped in the nets while trying to escape. Many family members gathered around it, seemingly trying to help, and another adult became entangled. I watched helplessly as a large male pilot had a rope tied to his flukes and was pulled backwards under the tarps to his death. As each of the larger dolphins were pulled under the tarps, the water began to turn a nauseating, reddish brown color. 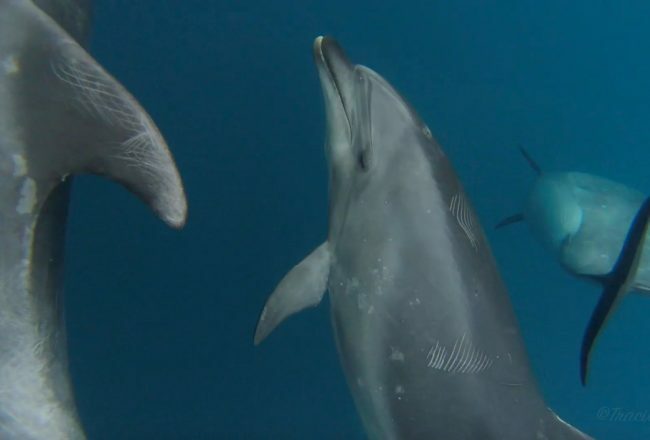 Witnessing the dolphins struggle for a breath of air, struggle for their very lives and yet, being unable to do anything other than document was one of the most painful and frustrating moments of my life. And then, the killing stopped for the day as it was time to transfer the dead to the butcher house. 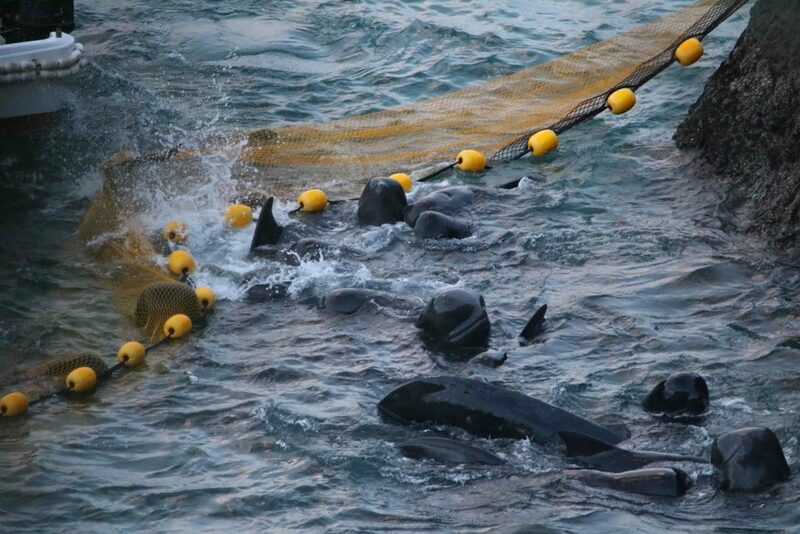 The surviving pilot whales could have returned to the outer net area, as far away from the slaughter as possible, but, as I’d seen two years ago they stayed in the killing area, practically swimming under the tarps searching for lost family members. Eventually, the hunters pushed them towards the outer cove so they could transfer the lifeless bodies. 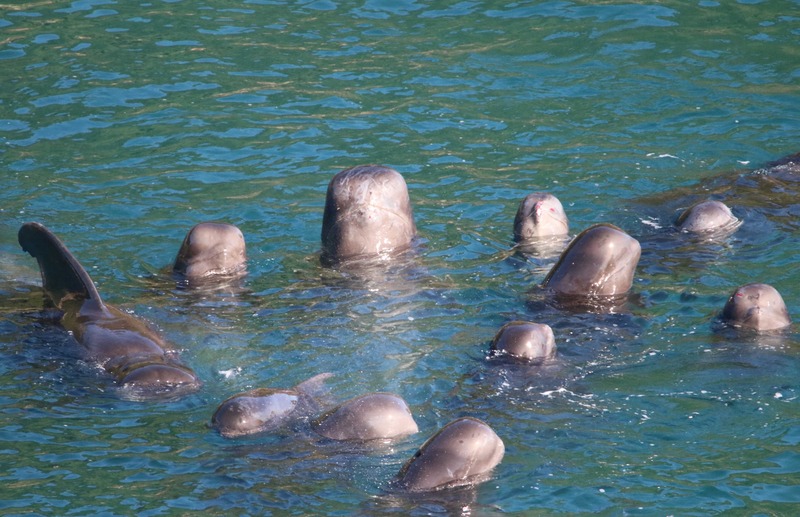 The remaining pilot whales huddled together. Again, the matriarch circled and tried to comfort the young. This time I could see the very young calves rubbing against her as though seeking comfort from the horror they had just experienced. I wondered what she was communicating to them? The hunters dragged body after body out from under the tarps, right past the surviving family members. 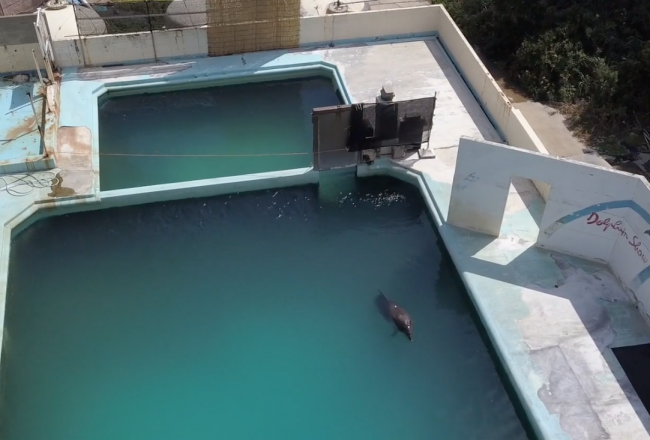 After their ‘work’ was done for the day, the survivors were left alone for another night filled with terror and still no food or water (pilot whales get their water from their food). Unfortunately, that afternoon I had to say goodbye to Vicki, as her time at Taiji was done. As much as I hated to see her go, I was relieved she wouldn’t have to witness the rest of this tragedy. Sleep was hard to come by, with visions of the horrors still fresh in my mind. 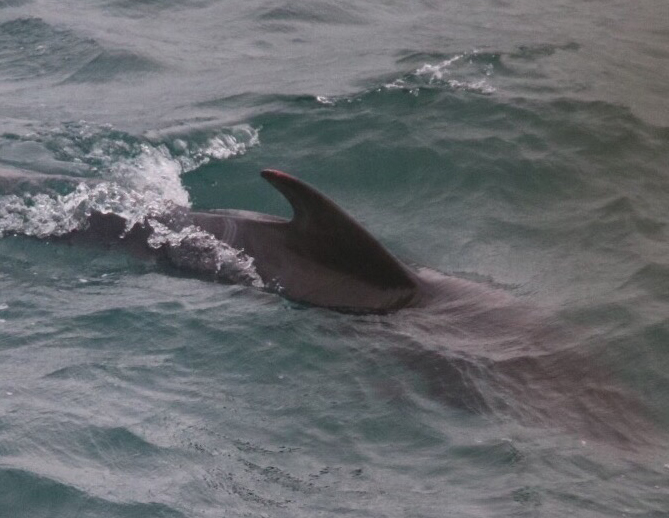 I knew the next morning would bring more of the same to the tortured pilot whales. The next day was a repeat of the last, as more adult pilot whales were rounded up for the kill, the survivors battered and bloody from their struggles. I could see skiffs turn their engines around and plow straight into the dolphins. I watched as hunters manhandled them, pushing some underwater to move them out of the way while they searched for larger adults to kill. I remember a small calf, its sweet face covered in blood. So much heartbreak. After the bodies had been dragged to the butcher house, the remaining family members were left for yet another night, their torture, unimaginable. Unbelievably, I found myself climbing up the stairs yet again on the following morning, my legs practically shaking. The killing was over quickly as there were few adults left. The matriarch who had taken care of, and comforted the young, was the first to go. I’ll never forget the image of her being pulled by a rope around her flukes under the tarps to her death – another painful memory etched into my mind and soul. What remained of the pilot whale family was left alone while the hunters transferred the bodies. Again, the dolphins would not leave the killing area. The time came for the hunters to ‘release’ the remaining pilot whales, whose bodies were too small to be slaughtered. It was a windy day and the sea was rough. Instead of driving the remaining family back to sea as I had seen two years ago, the hunters decided to use slings to transport the dolphins from the killing area to a banger boat, and then out to open water. But the process went terribly wrong, with another dark chapter written. I watched as slings were tied loosely to the sides of banger boats, the helpless pilot whales repeatedly smashed into the machinery while water submerged them. I wondered if they would still be alive when they were dumped out of those slings? Some pilot whales slipped out of the slings before reaching the banger boats. I watched in horror as one pilot whale was tied by the flukes, struggling violently while hunters looked on. 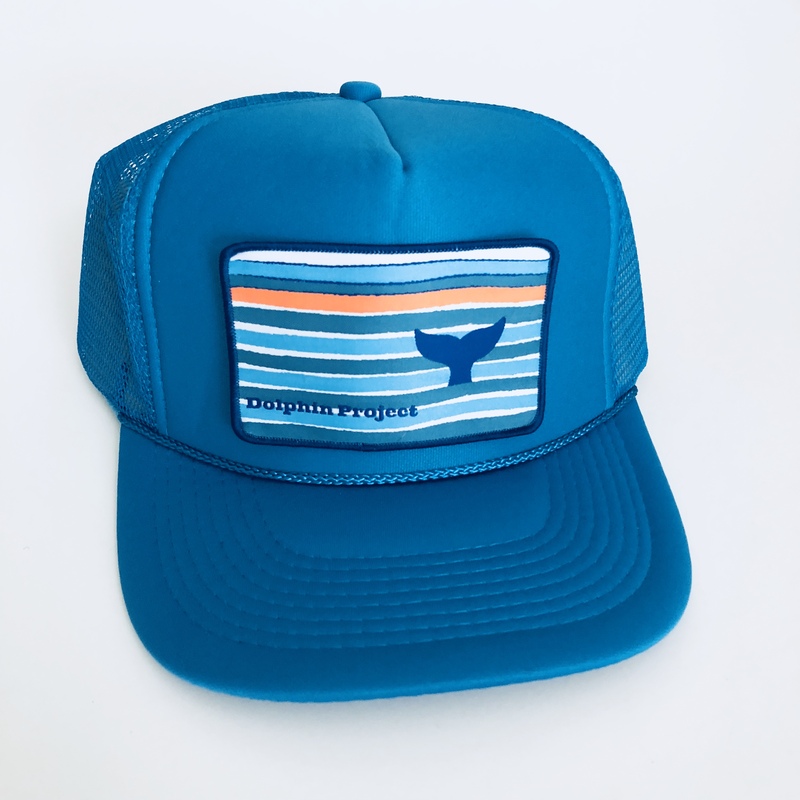 Slowly the struggle subsided as the dolphin drowned. Not one to miss an opportunity, hunters quickly covered its body with a tarp and transported it to the butcher house. Another pilot escaped the sling and tried to make it’s way back to the Cove. Approximately 20 pilot whales were dumped back at sea. During the last transport, a young pilot freed itself out of the sling. There was no attempt to retrieve it, and the young dolphin was left behind. 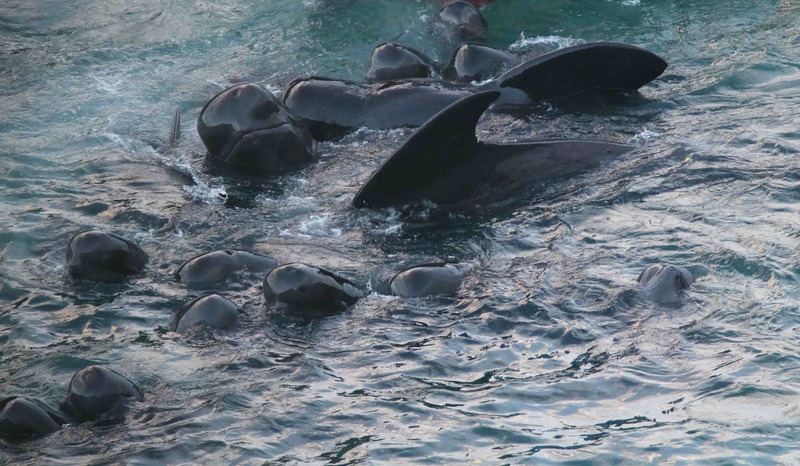 The events of these four days completely destroyed this innocent pilot whale family. The dolphins dumped at sea will likely not survive without the leadership of the matriarch, who is truly the “pilot” of the family. Perhaps somehow, a new leader emerged and was able to pilot the survivors to safety and survival. I hope the little one that was left behind somehow found it’s way back to its family. I need that hope. I, myself, felt as though I had been shattered into a million pieces. However, with the help of some very special people, I am putting the pieces back together. I will be stronger than ever, and am even more inspired to see this through, to continue to fight to the end, and be a voice for the voiceless. Update: On November 28, I noticed the pilot whale taken for captivity was not in the harbor pen. A large, black net was pulled from that pen. Was the pilot transported? Did it die? All I knew is that it was gone. 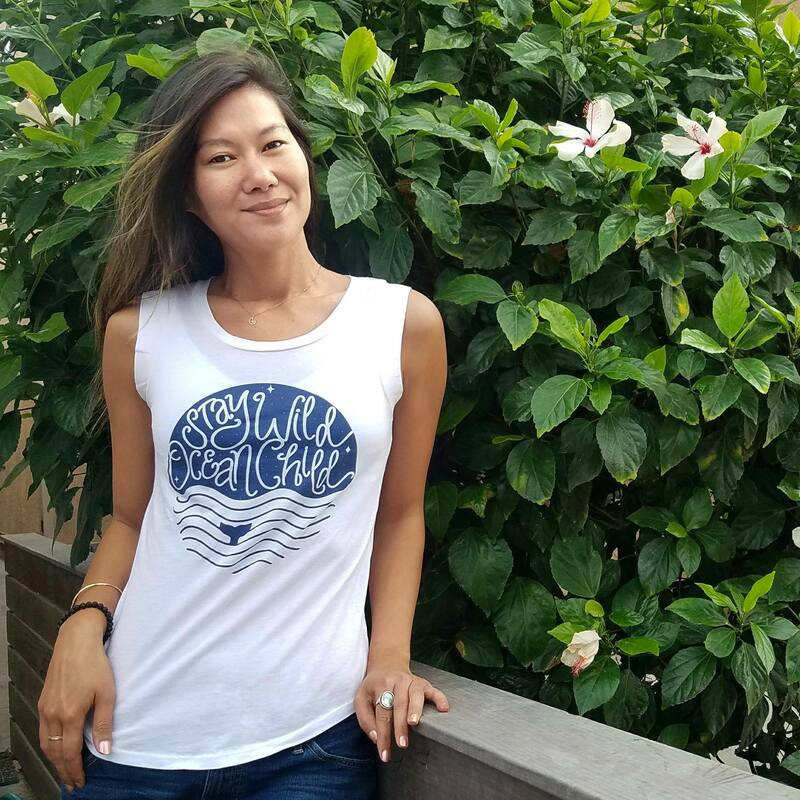 Watch Cynthia’s video clips of the pilot whale slaughter below.